Employees in Legg Mason’s Baltimore headquarters recently enjoyed a unique educational and cultural celebration of Black History Month featuring a performance by local artists. 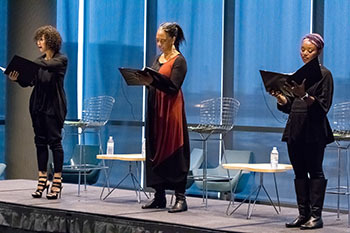 In their theatrical reading from New York Times Best Seller “The Warmth of Other Suns, The Epic Story of America’s Great Migration,” by Isabel Wilkerson, three cast members from Baltimore Center Stage treated the audience to a performance that was authentic, emotional and, at times, playful. The audience was taken back to the early 20th century in America’s Deep South as the performers assumed various roles in telling tales about Ida Mae Brandon Gladley, one of three central figures in the book, who joined six million African-Americans who left the South on what would later become known as the Great Migration. The book intertwines stories of the three with those of others who journeyed north and west in search of a better life for themselves and their families.